If you remember my review for a film called I Saw the Devil (found here) then you know how impressed I was with Choi Min-sik's performance. 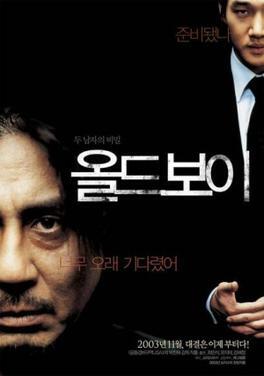 When I saw this film Oldboy streaming on Netflix I naturally decided to give it a watch since I wanted to make good on my word to watch more Choi Min-sik films. I'm glad I watched this one. I know I say that a lot (I have really good luck when it comes to picking media I know I will like), but in this case that statement is especially true. This is a movie about a man named Oh Dae-su who gets imprisoned for fifteen years by someone he doesn't know. Then fifteen years later he is released without any explanation at all. Oh Dae-su is a changed man after his experience. He is stronger than he has ever been thanks to his time spent shadowboxing whilst in confinement. He wants revenge, but who can he take out his revenge on? And why was he released? I don't want to say more because you really should discover the secrets of this film for yourself. However (and this is nothing spoilery), there is one particular fight scene that is so impressive that you probably wouldn't even believe that it was shot in one take. It took three days and seventeen tries to perfect, but the final result is certainly a scene stealer. The only editing during that entire scene was the knife in Oh Dae-su's back added by CGI. I kind of want to read the manga now. And yes, this movie was loosely based off a manga written by Tsuchiya Garon and illustrated by Minegishi Nobuaki. As for the movie, this film is apparently a part of director Park Chan-wook's "Vengeance Trilogy." The first film is Sympathy for Mr. Vengeance and the third film is Lady Vengeance. These movies aren't related by anything more than basic thematic issues, but they worth mentioning because if they are anything like OldBoy at all then... well, they'd be worth mentioning. And I guess something else to mention is that Spike Lee is remaking OldBoy. Just what we need. Another pointless remake of an already good film (since I highly doubt Lee used the manga as a source). I saw this movie a while back and really liked it. I didn't know the same actor was in the other one you discussed. I will have to see the other one now for sure. It will have to wait a little while because I'm going to see how many horror films I can digest in the next 30 days. I've got a bunch picked out on Netflix and am ready to go.